The biggest problem with ruling over a country isn’t the constant threat of betrayal or even doing your utmost to maintain your authority. We admit that dealing with murder plots isn’t a great aspect of the job description and neither is the fear that someone else could be named a Queen just by skipping a few steps on a chess board, but the right kind of gal can make a lasting legacy so long as a few important steps are taken along the way. Still, how is anyone expected to deal with such a royal dilemma all on their own!? Fortunately, we understand the problem and have devised the perfect solution: the Gold and Red Princess Crown! Nobody will dare question your right to rule when they see this literal gem sitting atop your brow. 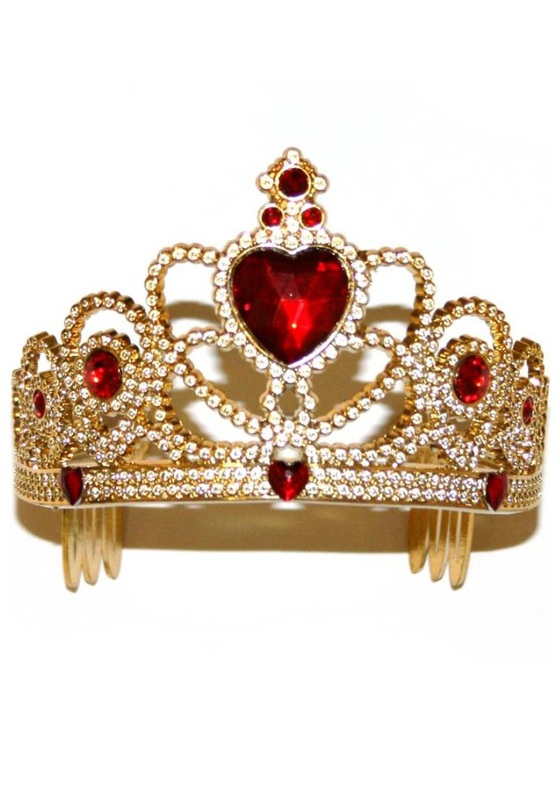 This gold-tone filigree style crown has red faceted faux gems, several of them in bright heart shapes, and is accented by countless faux diamonds to assure the sparkle will remain for your entire dynasty. Fastening keenly to your hair with back combs, you need not even worry about the common bulk and weight of some of those other crowns. Team this up with the right gown and, perhaps, a Scepter of the Queen of Hearts to complete the look. Then, just prepare for your loyal subjects to give their vow of fealty!